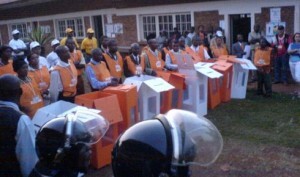 It’s difficult to make sense of the reactions of many Western governments and international actors to the disastrous elections in the Democratic Republic of the Congo (DRC) on November 28, 2011. Initial responses from the United States and the European Union were muted, and Belgium later congratulated President Joseph Kabila on his reelection. As the extent of fraud and lost votes have became clearer, some governments have come out with stronger criticisms of the elections. US Secretary Clinton was “deeply disappointed,” while EU High Representative Catherine Ashton echoed Clinton’s assessment and said that the EU would “re-evaluate” its cooperation. Yet today, both Western responses to the elections and their policies are unclear and tending dangerously toward the status quo of the last five years. The US Government, according to some, is very divided on Congo, and its public representatives have recently provided cautious statements on the elections and their aftermath. Consumed by their own economic troubles, no member of the EU has the interest to take the lead on reconsidering Europe’s Congo policy, while the UN stabilization mission in the Congo (MONUSCO) wants to move on from the elections and renew its focus on civilian protection. However, these signs of policy inertia could prove disastrous, since Western policies have so far done little to strengthen Congo’s governance, a key goal of many bilateral programs. While the Congo’s GDP growth for 2011 was just under seven percent, Congo dropped to last place in the UNDP’s latest Human Development Report, and its business environment, dominated by the corruption-laden mining industry, is considered one of the worst in the world. (It is telling of the personal nature of business in Congo, for instance, that the death of key Kabila-adviser Katumba Mwanke in a plane crash on 12 February has left foreign investors worried.) Above all, the 2011 presidential and legislative elections, which were an important indicator for the state of democratic governance in the country, were so compromised that the final results are called into question. As the members of Western donor countries continue to discuss their next steps, they could do worse than heed the recommendations of the Congolese people themselves, who already have provided useful but thus far disregarded recommendations on addressing Congo’s botched polls. Both civil society groups and the bishops of the popular and deeply influential Congolese Catholic Church, which deployed some 30,000 electoral observers, have called for the current national electoral commission (CENI) to correct its grave mistakes or to resign. Since the CENI has shown little incentive to reform, donor countries could request that the current CENI members resign and that a newly reconfigured CENI with civil society members be created, with a universally accepted CENI president—a move similar to the reforms in Nigeria after its 2007 elections. Loosely following the recommendation of the main opposition parties, donor countries could also press for a recount of the legislative elections. The current legislative results for the 500-seat parliament are being fiercely contested in the Supreme Court, but the Court’s competence to treat some 500 complaints is suspect, given its limited staff and space and President Kabila’s last-minute appointment of eighteen new judges in the middle of the electoral campaign. Guided by a newly reconstituted CENI, Congolese officials could call for a review based on the hard copies of the poll results from each electoral district. In cases where the winner is called into question, the CENI could then call for a re-vote in those districts at the same time that it holds the provincial elections, scheduled for later this year. This won’t legitimize the electoral process, but it could at least salvage part of the process and pave the way for an independent and legitimate legislature. Another overlooked recommendation from Congolese is the call for an inclusive national dialogue among all major parties, a recommendation that the largest civil society electoral platform has proposed. While attempts at an inclusive dialogue can quickly devolve into a useless talk shop, a real dialogue where senior members from all major parties and coalitions are forced to address their greatest differences could prepare for a better electoral climate in future polls and diffuse the volatile atmosphere that characterized the November 2011 elections. No such regular meetings occurred during the 2011 electoral period, and the campaign rhetoric was all the more strident because of its absence. Of course, these recommendations will carry even more weight if the Congolese themselves show their support. So far, the myriad declarations and press conferences from politicians and civil society and religious leaders suggest that they want tougher stances from international partners to address the current political crisis in Congo. But if more indications are needed, the pro-democracy march in Kinshasa planned for Thursday, 16 February, 2012, might well be the sign. Thank you for this interesting and thoroughgoing essay. There is, as you point out, little incentive for the CENI to do anything other than carry on with ‘business as usual.’ A careful reading of recent statements from the international community (make what you will of this term) reveals dissatisfaction with the electoral process, but that thus far few tears have been shed over Mr. Tshisekedi’s loss. The Catholic Church in the DRC is far from neutral, whatever else one may choose to believe of it (Tshisekedi’s brother, for example, is an influential archbishop in Kasai Occidental). A recount—even a partial one—will accomplish little, and donors have yet to display any particular appetite for the expenditure and disruption that would be caused by anything like a ‘do-over’ in some districts. It is clear to all that there were substantial irregularities on 28 November, but the election was in large part decided many months earlier with the revision of the electoral roll and the constitutional changes in January 2011 which allowed Kabila to consolidate his hold on power. My personal feelings aside, I do not find the case for any significant change in the international community’s approach to the DRC, as it is presented here, to be compelling. The DRC’s neighbours and donors know that they have little to gain from ‘stirring the pot’ at this juncture, and a majority of the country’s citizens already have a list of concerns far more pressing than a revisiting of last year’s controversial polling. Thanks, bailfoy, for taking the time to respond to my blog post. You raise a lot of points that others have raised, so they’re well noted. I think Western donors have shown little interest in stirring the pot, as you say, because they see few options. My point here was to propose some options that are also coming out of Congo. On the re-count option, a re-count by itself would achieve little yet, taken together with further steps, it could salvage part of the process. If so many votes are discredited so as to change the current National Assembly, a new CENI might be compelled to call for new legislative elections that could occur with the provincial ones, which might then get more intl support. On your point about Congolese citizens priority of needs, citizens do have a list of concerns and many see the dysfunctional nature of their government as part of that problem. People in every corner of Congo I’ve visited over the last three years (i.e., nine provinces) have expressed a deep disappointment with their elected officials and now it appears that an increasing number distrust political and non-violent processes. Since this is a dangerous situation that makes violence more appealing to a broader group of people, it should be a concern to donor countries. Unfortunately, Congolese themselves (and others) are proposing options that are falling on deaf ears in the West. I wanted to highlight some of the options.